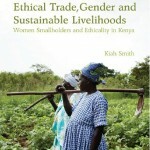 Kiah Smith has published a book on Ethical Trade, Gender and Sustainable Livelihoods. Through an in-depth case study of smallholder subsistence and French bean farming in Kenya, the book grounds the analysis of livelihoods, gender and ethical trade in women smallholders’ perspectives, links the macro level of markets with the micro level of livelihoods, and engenders relations of power, structure and agency in food networks. Read more on the attached presentation, or at the publishers website. This entry was posted in Books on March 25, 2014 by admin.